Many Mesa restaurants see no better way to enjoy dinner than on an outdoor patio with stunning sunsets dishing up the ambiance. Here’s some of the standouts for al fresco dining in City Limitless. The Twilight Dinner Cruise is a 2 ½ hour cruise through Canyon Lake highlighting breathtaking views of the desert, including Big Horn sheep, under the last moments of the days’ sun. Dolly Steamboat also invites guests to enjoy a 2 ½ hour Twilight Astronomy Dinner Cruise with astronomer Dr. Sky, Steve Kates, on board, you’ll dine under the desert stars and see them reflect off the still waters of Canyon Lake after dark. Postino is a local Wine Cafe best known for delicious bruschetta boards including out favorite, the tomato jam and fresh sheeps milk cheese option. They recently opened a new location in Downtown Gilbert next to Hale Theatre and the Gilbert water tower. Postino’s outdoor patio grass patches allow diners to opt for table seating or “picnic” style dining on the grass. Those feeling game can also challenge friends to a game of bocce ball on the patio. Its yellow garage-style doors and rotating public art installations make Postino a stand out as a great pick for al fresco dining! 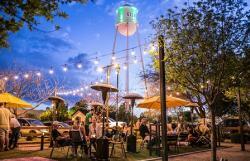 What’s one way to “plus” an outdoor shopping village – al fresco dining! Enjoy the weather and outdoor ambiance of the Dana Park Village Square! Being located in the midst of Dana Park, Pita Jungle is located in the perfect location to pause and enjoy the bubbling fountains and manicured flower beds of this shopping square. Next time you’re soaking up the sunset over dinner, snap a photo and share it with us! Use the hashtag #mesacitylimitless to showcase your favorite Mesa destinations for al fresco dining in the desert. Cheers!